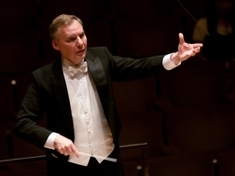 Donald Schleicher has served as Professor of Conducting and Director of Orchestral Studies at the University of Illinois since 1995. He was also on the faculty of the University of Michigan for nine years. Professional positions include eight years as Music Director and Conductor of the Quad City Symphony Orchestra and for nine summers, he was Music Director and Principal Opera Conductor for the Pine Mountain Music Festival. Recently, he was appointed as the Artistic Director of the Pine Mountain Music Festival. At the outset of his career, he spent seven years as a high school band director in Williamsville, New York. Schleicher has conducted the Inchon (South Korea) Philharmonic, the Daegu (South Korea) Symphony Orchestra, the Orquesta Filarmonica de la UNAM of Mexico City, the South Dakota Symphony, and the orchestras of Bridgeport, Tallahassee, and Lansing. He has also appeared as a guest conductor at the Great Lakes Chamber Music Festival in Detroit. In April of 2011, he lead the production of “The Merry Widow” with the Missouri Opera Theater. He is frequently invited to lead performances or provide conducting master classes at many of the countries major music schools such as the Oberlin Conservatory, Eastman School of Music, Baylor University, University of Minnesota, Ithaca College, Ohio State University, and Shepherd School of Music at Rice University. As an enthusiastic advocate of public school music education, Mr. Schleicher has conducted All-State orchestras, festivals, and youth orchestras in nearly every state of the United States. He is also active as a clinician for public school music educators. ​Pianist Russell Miller has been a coach and teacher of vocal repertoire at Eastman since 1995. He has performed throughout the United States and abroad as soloist and accompanist, including concert tours to Korea and Hong Kong with tenor Robert White and to Alaska and the former Soviet Union with cellist Stephen Kates. With violist Donald McInnes, he has recorded works of Hindemith and Loeffler on the Kleos Classics label. Notable vocal collaborations include Schubert’s Winterreise with tenor Robert Swensen at the Pierpont Morgan Library, as well as in recital with Jan Opalach, Julia Broxholm, Susan Shafer, Marilyn Horne and Håkan Hagegård. For twelve years he was the musical director for the vocal quartet “SATB”, which performed a wide variety of repertoire from classical chamber pieces to Broadway. A native of Los Angeles, Dr. Miller studied at the University of Southern California, the Manhattan School of Music and The Juilliard School, and holds a doctorate from the University of Michigan. His principal teachers have been Edith Knox, Brooks Smith, Gwendolyn Koldofsky, Marshall Williamson, Margo Garrett, Martin Katz, Louis Nagel and Graham Johnson. For twelve years he was a staff pianist and faculty member at the Music Academy of the West in Santa Barbara and also served as pianist and harpsichordist for the Florentine Opera of Milwaukee for their productions of Rossini’s La cenerentola and Verdi’s Aïda. Besides his current appointment at Eastman, Dr. Miller has also held faculty positions at The Cleveland Institute of Music, Bowling Green State University (Ohio), The Ohio State University and Oberlin College Conservatory, and recently as a visiting teacher at the University of Kansas and the University of Wisconsin, Milwaukee. In the summers, besides his years at the Music Academy, he has coached song and opera at the Pine Mountain Music Festival in the Upper Peninsula of Michigan, the “Oberlin in Italy” program and currently at the Vancouver International Song Institute in British Columbia. ​​​Li-Kuo Chang has been the assistant principal viola of the Chicago Symphony Orchestra since 1988, appointed by Sir Georg Solti. He has appeared with many orchestras as soloist, including the Chicago Symphony, most recently with Pinchas Zukerman performing Bach’s Sixth Brandenburg Concerto. He also has been an active chamber music performer collaborating with many renowned artists, such as Daniel Barenboim, Christoph Eschenbach, Pinchas Zukerman, in concerts at the Orchestra Hall in Chicago, as well as at Ravinia Music Festival, Los Angeles Music Center, Staatsoper in Berlin, Lucerne Music Festival and Jerusalem Chamber Music Festival, among other venues around world. From 2000 to 2007, he was invited by Daniel Barenboim to be the guest solo viola of the Deutsche Staatsoper Berlin and Berlin Staatskapelle, and toured with these two ensembles in their many European and Asian tours, including Richard Wagner’s complete Ring des Nibelungen performances in Japan in 2002. Jim Hirsch has served as Executive Director of Chicago Sinfonietta since August of 2004. During his tenure at the Sinfonietta the organization’s budget has increased by over 65% and programming has expanded in important new directions. These new initiatives include: Project Inclusion and Project Inclusion Ensembles, minority fellowship programs that seek to address the dearth of minority musicians playing in U.S. orchestras; and the SEED Program that provides high school age student-musicians with instruction in ensemble playing techniques. Hirsch guided the Sinfonietta through the retirement of Founding Music Director Paul Freeman in June of 2011, the appointment of his successor, Mei-Ann Chen in July of 2011, and the orchestra’s re-location from River Forest to Naperville for its west suburban concert series. ​Prior to his work at Chicago Sinfonietta, Hirsch served as Vice President and Executive Director of the Chicago Association for the Performing Arts, managers and programmers of the Chicago Theatre, and as the Executive Director of the Old Town School of Folk Music. During his tenure at Old Town from 1982 until 2000, the organization became the largest institution of its kind in the country. The organization’s budget grew from $300,000 in 1986 to $7 million in 2000. In 1999, Hirsch completed work on a $10.2 million capital campaign that funded the organization’s expansion to the new Chicago Folk Center, a 43,000 square-foot building that the City of Chicago donated to the School, and established a $1 million endowment fund. ​Hirsch has served as a grants panelist for the Illinois and Oregon Arts Councils and as a member of NARAS (Grammy) Awards and Nominations committee. He produced a nationally syndicated radio program for NPR and has released three commercial recordings. Hirsch was chosen by Crain’s Chicago Business for their annual 40 Under 40 article that honors Chicago’s up-and-coming business executives under 40 years of age and was named Chicago Arts Entrepreneur of the Year in 1996 by Columbia College. In 1998, he was chosen as one of Chicago Magazine’s Chicagoans of the Year. In 2011 Hirsch received a Midwest/Chicago Emmy Award for Best Arts and Culture Documentary as Co-Producer of Chicago Sinfonietta: Sounds of Diversity. Liz began her formal career at The Philadelphia Orchestra. During her tenure, Liz was responsible for expanding the marketing for both the Philadelphia Orchestra as well as Peter Nero and the Philly Pops. A primary tool was development of partnerships, promotions and social media strategy in support of ticket sales in lieu of budget dollars. Liz oversaw the creation of several pilot programs which continue to this day including eZSeatU, a college student ticket program in which a student can purchase a season-long pass for $25 and get unlimited access to all concerts, as well conducted extensive audience research to better understand patrons and tailor concert offerings. Liz then moved on to Chicago Symphony Orchestra as Director of Marketing, a position she has held for over 6 years. Liz oversees a team of 5 to achieve ticket sales of over $23 million a season for a variety of programs including Chicago Symphony Orchestra concerts, as well as holiday concerts, CSO at the Movies, CSO Family Concerts and the Symphony Center Presents (SCP) Jazz, Chamber, Piano, and Visiting Orchestra series. In addition to revenue goals, Liz is responsible for achieving capacity utilization goals, audience make-up goals, and finding ways to make the CSOA accessible to all types of music lovers. In addition to planning and executing the marketing plans for over 250 concerts a season, Liz is responsible for the research for audience development initiatives including GEN XY and Latino audience development, cultivating audiences in Chicago’s Western suburbs, as well as building an online community through social media and other outlets that engage with the original content that is developed on the CSO’s digital magazine, Sounds & Stories. Liz received her B.S from University of Illinois-Urbana in Business-Marketing with a minor in Clarinet performance. Liz received her MBA from Smeal College of Business at Penn State University- State College PA. In addition to playing the piano and clarinet, Liz sits on the board as secretary for the Chicago Metamorphosis Orchestra Project (ChiMOP), a non-profit start-up which utilizes instrumental and orchestral training as a platform for social change among elementary and middle school students on Chicago’s west side. A native of Detroit, Max Raimi has been a violist in the Chicago Symphony since 1984. He is an active chamber musician and served as a chamber music coach at Northwestern University for many years. A prolific composer, Max has received commissions from many ensembles and institutions, including the Chicago Symphony, the Library of Congress and the American Chamber Players. In February 1998, His Elegy for 12 violas, harp, celeste, and percussion was performed at three Chicago Symphony subscription concerts conducted by Daniel Barenboim. Riccardo Muti and the Chicago Symphony performed the World Premiere performance of his Three Lisel Mueller Settings at three subscription concerts in March of 2018, a Chicago Symphony commission. Mr. Raimi’s arrangements have enjoyed wide circulation as well, having been performed by Daniel Barenboim on piano, among others. In August 1985, a sellout crowd at the old Comiskey Park heard the Chicago Symphony viola section play his arrangement of The Star-Spangled Banner before a Chicago White Sox game, and a three-viola version was twice performed at the old Chicago Stadium for Michael Jordan and the Chicago Bulls. On two occasions, Riccardo Muti has conducted Mr. Raimi’s orchestration of the University of Michigan fight song “Hail to the Victors” at Hill Auditorium in Ann Arbor. He lives in Chicago with his wife, Barbara Flood, and their son, Paul.